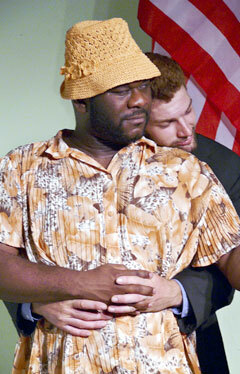 D. Omar Williams, left, offers a comic performance as Bernard, and Thomas C. Smith plays the prosecutor, in The Actors Group's production of "Romance." The works of playwright David Mamet are very much an acquired taste, and certainly not for those who take offense at crude language and adult vocabulary. The f-word is basic English for many of Mamet's characters, and the challenge in watching a Mamet play often involves sifting through all the gutterspeak in search of something more profound than profanity. Place: Yellow Brick Studio, 625 Keawe St. In "Romance," directed by local theater veteran David Farmer for The Actors Group, Mamet may be saying that the search for world peace can be easily blocked even when both sides desire it. The story takes place in an American courtroom while representatives of Israel and the Palestinians are meeting nearby. The defendant, a Jewish chiropractor, is charged with an unspecified offense that involves a trip to Hawaii that he refuses to admit making. The defense attorney is a Christian. The prosecutor is a closet homosexual. The judge is barely lucid because he has been overmedicating himself for hay fever despite the bailiff's repeated efforts to unobtrusively confiscate the pills. Nerves fray and tempers flare as the prosecutor's examination of the defendant bogs down in minutia. The defendant refuses to recognize his signature on a document or answer even the simplest questions. The judge complains about the inconveniences caused by the peace conference and then struggles to stay awake as the opposing attorneys spar. It isn't long before the proceedings erupt in ever-cruder exchanges of expletives, insults and stereotypes regarding Jews, Arabs, homosexuals, Catholic priests, Christians in general, chiropractors, doctors and attorneys. "Why did you go to law school if you don't want to lie (for me in court)?" the defendant snarls at his attorney during a recess. Their expletive-rich conversation establishes beyond doubt that one is as bigoted as the other. Ironically, even when the judge and the prosecutor are persuaded that the defendant has a workable plan to bring lasting peace to the Middle East, the court struggles to handle the simple legal procedures necessary to put the plan into action. Masseh Ganjali quickly comes to the fore as the annoyingly evasive, arrogantly ethnocentric defendant, and Stu Hirayama dominates much of the action with a thoroughly detailed portrayal of the muddled and rambling judge. Larry Fukunaga is another asset in director Farmer's cast as he makes a seemingly insignificant role the catalyst for several hilarious moments. D. Omar Williams makes the most of his ample physical assets in his broad comic performance as Bernard, the prosecutor's barely dressed, stereotypically flamboyant boyfriend. S. Rick Crump adds another infusion of comic mayhem with a short and well-played portrayal of a chiropractor-baiting physician. What the show needed on opening night last Thursday was a tighter timing in the acid-etched exchanges among Ganjali, Hirayama and the two attorneys -- Kevin Agtarap (defense) and Thomas C. Smith (prosecution). Mamet's staccato, rapid-fire dialogue should sizzle, but time and again the sparks were quenched because each actor was waiting a split-second longer than necessary to respond to the previous speaker.